How is a crash different from an accident? Pedestrian and Bicycle Crash Tool (PBCAT). Crash frequency using geographic information systems (GIS). –	4,749 pedestrians were killed. –	622 bicyclists were killed. –	Bike/pedestrian crashes accounted for 13% of all highway fatalities. –	There were 70,000 urban pedestrian injuries. –	There were 46,000 urban bicyclist injuries. 33% of all crashes result in serious injury or death. Alcohol or drugs are involved in about 15% of all crashes. Crashes most often occur during late afternoon or early evening hours. About 2/3 of all crashes occur in urban areas. 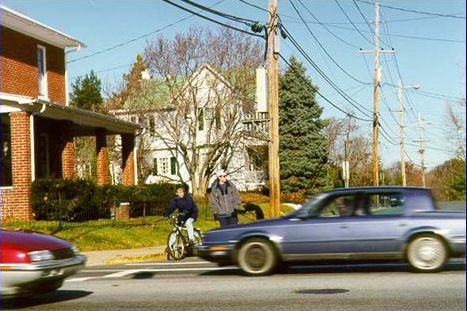 69% of fatal pedestrian crashes occur at nonintersection locations. Most injury crashes occur at intersections. Pedestrians were solely at fault in 43% of crashes. Drivers were solely at fault in 35% of crashes. About 3/4 of all crashes occur at nonintersection locations. 18% of bicycle-motor vehicle crashes result in serious injuries or death. Crashes most often occur during late afternoon or early evening. About 2/3 of all fatal crashes occur in urban areas. Bicyclists were solely at fault in 50% of the crashes. Younger bicyclists were at fault more often than drivers. 36% of crashes are parallel path collisions. 57% of crashes are crossing path collisions. Speed humps versus speed tables. Full and partial street closures. – Q &A-based crash typing. –	Benefit-cost used to rank different projects. –	Reduction in crash cost (benefit). –	Three years of crash data. –	Service life of project. Bicycle and pedestrian crashes are preventable. Bicycle and pedestrian crashes account for a significant portion of the highway safety problem in the United States. The types of crashes that occur and the characteristics of these crashes make prevention a more attainable goal. Many tools are available to assist in crash analysis. Crashes and countermeasures have associated costs. Safety improvement index or benefit-cost analysis can be used to rank safety projects.